The Cuba High School Student Council has chosen EmiLee Johns as the May Senior of the Month. EmiLee is the daughter Stacey Moore and Phil Johns of Cuba, Illinois. Her current classes are Adult Living, Horticulture, Art, English IV, Sociology, Weights, and Current Events. During high school, EmiLee has been involved in Softball, Art Club, Volleyball, Spanish Club, FCCLA, and FFA. EmiLee plans to attend Spoon River College this fall. Then, she plans on transfering to a University to study Marine Biology. Cuba High School Student Council presents the Senior of the Month award each month. The student is chosen based on the following criteria: Self-management, responsibility, quality of work, high standards of attendance, superior academic principles, honesty, energy, optimism, teamwork, and positive use of rules or values. 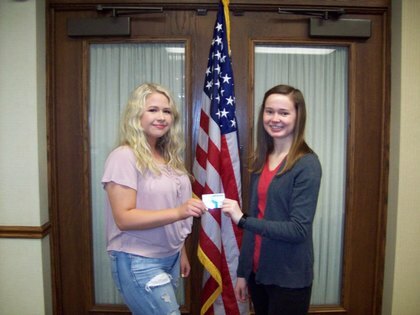 Presenting a $50.00 U.S. gift card to EmiLee Johns is Madison Pratt from Mid America National Bank. The Cuba High School Student Council has chosen Jessica Young as the April Senior of the Month. Jessica is the daughter of Charlesa and Dale Young of Cuba, Illinois. Her current classes at Cuba High School are Art II, Horticulture, Adult Living, English IV, Sociology, Weights, and Office Procedures. During High school, Jessica has been involved in FCCLA, Softball, Volleyball, and Spanish Club. She has also had high honors. Jessica plans to go to Spoon River College for two years on a softball scholarship and she plans to study to become a vet technician. Cuba High School Student Council presents the Senior of the Month award each month. The student is chosen based on the following criteria: Self-management, responsibility, quality of work, high standards of attendance, superior academic principles, honesty, energy, optimism, teamwork, and positive use of rules or values. Presenting a $50.00 U.S. gift card to Jessica Young is Lori Shaeffer from Mid America National Bank. The Cuba High School Student Council has chosen Alex Oller as the March Senior of the Month. Alex is the son of Sara Oller and the late Riley Oller of Cuba, Illinois. His current classes are Art III, Pre Calculus, Adult Living, English IV, Sociology, Weights, and Child Care. During high school, Alex has been involved in Football, Baseball, FFA, Freshman Class Officer, and Homecoming King. Alex plans on attending Spoon River College next fall. Cuba High School Student Council presents the Senior of the Month award each month. The student is chosen based on the following criteria: Self-management, responsibility, quality of work, high standards of attendance, superior academic principles, honesty, energy, optimism, teamwork, and positive use of rules or values. Presenting a $50.00 U.S. gift card to Alex Oller is Madison Pratt from Mid America National Bank. The Cuba High School Student Council has chosen Connor Kington as the February Senior of the Month. Connor is the son of Ken and Cora Kington of Cuba, Illinois. His current classes are Art IV, Chemistry, PE, Foods II, and English IV at Cuba, and Dual Credit Speech Communication and Music Appreciation at Spoon River College. During high school, Connor has been involved in National Honor Society, Drama Club, Game Club, and Archery where he finished 6th in the state in 2017 and was a national qualifier. He has also been designated as an Illinois State Scholar for 2018. Connor plans to finish his Associate’s Degree at Spoon River College and then transfer to Western Illinois University in Macomb. At WIU he plans to major in Clinical Lab Science with hopes of working in a hospital laboratory as a Lab Scientist. Cuba High School Student Council presents the Senior of the Month award each month. The student is chosen based on the following criteria: Self-management, responsibility, quality of work, high standards of attendance, superior academic principles, honesty, energy, optimism, teamwork, and positive use of rules or values. Presenting a $50.00 U.S. gift card to Connor Kington is Lisa Emberton from Mid America National Bank. The Cuba High School Student Council has chosen Alexis Clark as the January Senior of the Month. Alexis is the daughter of Tiffanie and Dennis Clark of Cuba, Illinois. Her current classes are Calculus, Dual Credit Horticulture, Art IV, Dual Credit Psychology, Sociology, English IV, and Current Events. Alexis has been involved in Art Club, Drama Club, Spanish Club, FFA, Family, Career, and Community Leaders of America, Softball, and is the Vice President of the senior class. Alexis plans to finish her Associates degree at Spoon River College. She will only have a year left due to her taking Dual Credit courses throughout high school. Upon completing her Associates degree, Alexis plans to transfer to a University to complete her Bachelor's Degree. Cuba High School Student Council presents the Senior of the Month award each month. The student is chosen based on the following criteria: Self-management, responsibility, quality of work, high standards of attendance, superior academic principles, honesty, energy, optimism, teamwork, and positive use of rules or values. Presenting a $50.00 U.S gift card to Alexis Clark is Lisa Emberton from Mid America National Bank. The Cuba High School Student Council has chosen Lake Luthy as the December Senior of the Month. Lake is the son of Chuck and Cindy Luthy of Cuba, Illinois. His current classes are Calculus, Chemistry, English IV, Introduction to Psychology, Weights, Dual Credit College Algebra, and Dual Credit Ethics at Spoon River College. During high school, Lake has been involved with FFA, FCCLA, and Student Council. He is a member of National Honor Society and was recently announced as an Illinois State Scholar. He is a lifeguard at Canton YMCA where he teaches swim lessons. He also volunteers as a karate instructor. Lake has been accepted to Knox College in Galesburg and will be attending in the fall. Cuba High School Student Council presents the Senior of the Month award each month. The student is chosen based on the following criteria: Self-management, responsibility, quality of work, high standards of attendance, superior academic principles, honesty, energy, optimism, teamwork, and positive use of rules or values. Presenting a $50.00 U.S. gift card to Lake Luthy is Margaret Miller from Mid America National Bank. The Cuba High School Student Council has chosen Brynn Brooks as the November Senior of the Month. Brynn is the daughter of Jerry and Miranda Brooks of Cuba, Illinois. Her current classes are Accounting, Child Care, Chemistry, English IV, Intro to Psychology, Weights, and Modern World History. During high school, Brynn has been involved in Family, Career, and Community Leaders of America, Peer Assistance, Yearbook, Track and Field, Student Council, National Honor Society, and Renaissance. Brynn plans to attend Culver-Stockton College next fall to major in education. Cuba High School Student Council presents the Senior of the Month award each month. The student is chosen based on the following criteria: Self-management, responsibility, quality of work, high standards of attendance, superior academic principles, honesty, energy, optimism, teamwork, and positive use of rules or values. Presenting a $50.00 U.S. gift card to Brynn Brooks is Margaret Miller from MidAmerica National Bank. The Cuba High School Student Council has nominated Avonlea Strait as the October Senior of the Month. Avonlea is the daughter of Jennifer Strait and Stormy Strait of Cuba, Illinois. Her current classes at Cuba High School are English IV, Conservation, and Art IV. She takes Dual Credit Math, Biology, and Criminal Justice at Spoon River College. During High school, Avonlea has been involved in Cheerleading, Student Council, Peer Assistance, Spanish Club, National Honor Society, FFA, Volleyball, Drama Club, Art Club, Class President- Freshman, Sophomore, and Junior year, and Softball. While at Spoon River College, Avonlea has been invited to join Phi Theta Kappa, and will be inducted in the spring. Avonlea will graduate High School with her Associates degree and then plans to attend Southern Illinois University in Carbondale this Fall and Major in Liberal Arts- Pre-Law. Upon completing her Bachelor degree, she plans on staying at SIUC and going to their Law school. Cuba High School Student Council presents the Senior of the Month award each month. The student is chosen based on the following criteria: Self-management, responsibility, quality of work, high standards of attendance, superior academic principles, honesty, energy, optimism, teamwork, and positive use of rules or values. Presenting a $50.00 U.S. gift card to Avonlea Strait is Margaret Miller from Mid America National Bank. The Cuba High School Student Council has chosen Lily Abernathy as the September Senior of the Month. Lily is the daughter of Tammy Abernathy and Eric Abernathy of Cuba, Illinois. Her current classes are Current Events, Weights & Conditioning, Algebra II, Environment & Ecology, Intro to Psychology, English IV, and Art IV. During high school, Lily has been involved in Softball, Art Club, Drama Club, Family, Career, and Community Leaders of America, Honorable Mention, and Peer Assistance. Lily plans to attend Spoon River College and Western Illinois University to major in Nursing. Cuba High School Student Council presents the Senior of the Month award each month. The student is chosen based on the following criteria: Self-management, responsibility, quality of work, high standards of attendance, superior academic principles, honesty, energy, optimism, teamwork, and positive use of rules or values. Presenting a $50.00 U.S. gift card to Lily Abernathy is Carol Oatman from MidAmerica National Bank. The Cuba High School Student Council has chosen Ian Noe as the May Senior of the Month. Ian is the son of Lori and Richard Noe of Smithfield, Illinois. His current classes are Adult Living Art III, Art IV, P.E., Ag Mechanics, English IV, and Child Care. During high school, Ian has been involved in Football, Basketball, FCCLA, Art Club, FFA, and the Welding Team. Ian plans to join the Navy at the end of this summer. Cuba High School Student Council presents the Senior of the Month award each month. The student is chosen based on the following criteria: Self-management, responsibility, quality of work, high standards of attendance, superior academic principles, honesty, energy, optimism, teamwork, and positive use of rules or values. Presenting a $50.00 U.S. gift card to Ian Noe is Lisa Emberton from Mid America National Bank. The Cuba High School Student Council has chosen Sydney Bowcott as the April Senior of the Month. Sydney is the granddaughter of Chris and Joe Brewer of Canton, Illinois. Her current classes are Calculus, Living Environments, Adult Living, English IV, Physical Education, Sociology, and Art IV. During high school, Sydney has been involved in Dance Force, Volleyball, Softball, Student Council, Art Club, Drama Club, and FFA. Sydney is attending the University of Missouri in Columbia this fall to major in biology. Upon completing her degree, she plans to attend Medical School in hopes to become a Renal Care Specialist. Cuba High School Student Council presents the Senior of the Month award each month. The student is chosen based on the following criteria: Self-management, responsibility, quality of work, high standards of attendance, superior academic principles, honesty, energy, optimism, teamwork, and positive use of rules or values. Presenting a $50.00 U.S. gift card to Sydney Bowcott is Lisa Emberton from Mid America National Bank. The Cuba High School Student Council has chosen Olivia Orr as the March Senior of the Month. Olivia is the daughter of William and Grace Orr of Cuba, Illinois. Her current classes are Conservation, Modern World History, Adult Living, English IV, Ag Business Management, Weights, and Art IV. During high school, Olivia has been involved in FFA, Art Club, Drama Club, and Spanish Club. Olivia plans to attend Coe College in Iowa this fall and major in biology. Upon completing her degree, she plans on going to veterinary school to become a certified Veterinarian. Cuba High School Student Council presents the Senior of the Month award each month. The student is chosen based on the following criteria: Self-management, responsibility, quality of work, high standards of attendance, superior academic principles, honesty, energy, optimism, teamwork, and positive use of rules or values. Presenting a $50.00 U.S. gift card to Olivia Orr is Lisa Emberton from Mid America National Bank. The Cuba High School Student Council has chosen Peter Howerter as the February Senior of the Month. Peter is the son of Niki Howerter and John Howerter of Smithfield, Illinois. His current classes are Adult Living, Weights, Algebra II, Anatomy and Physiology, Ag Business Management, English IV, and Current Events. During high school, Peter has been involved in Football, Track and Field, FFA, and FCCLA. Peter plans on going to Army Basic training, Advance Individual Training, after completing training he plans on deploying or attending WIU for a degree in Ag Business. Cuba High School Student Council presents the Senior of the Month award each month. The student is chosen based on the following criteria: Self-management, responsibility, quality of work, high standards of attendance, superior academic principles, honesty, energy, optimism, teamwork, and positive use of rules or values. Presenting a $50.00 U.S. gift card to Peter Howerter is Michelle Banta from Mid America National Bank. The Cuba High School Student Council has chosen Chase McClaughry as the January Senior of the Month. Chase is the son of Marlynna and Lewis of Fiatt, Illinois. His current classes are American Studies, Living Environments, Art, English IV, Physical Education, Foods II, and Office Procedures. During high school, Chase has been involved in Football, Baseball, Student Council, Golf, Basketball, Family, Community, and Career Leaders of America, Spanish Club, Future Farmers of America, and Fellowship of Christian Athletes. Chase plans on attending Monmouth or Bradley next fall to major in political science. He plans on working abroad in diplomacy and working in the environment for greener solutions everywhere. Cuba High School Student Council presents the Senior of the Month award each month. The student is chosen based on the following criteria: Self-management, responsibility, quality of work, high standards of attendance, superior academic principles, honesty, energy, optimism, teamwork, and positive use of rules or values. Presenting a $50.00 U.S. gift card to Chase McClaughry is Lisa Emberton from Mid America National Bank. The Cuba High School Student Council has chosen Renee Mance as the December Senior of the Month. Renee is the daughter of Steve and Christy Mance of Cuba, Illinois. Her current classes are Physics, English IV, Art IV, Pre Calculus, Accounting, Art Portfolio Prep, and Dual Credit Political Science at Spoon River College. During high school, Renee has been involved in Volleyball, Softball, Dance Force, Peer Assistance, Yearbook, Art Club, Family, Career, and Community Leaders of America, National Honor Society, and Student Council. Renee plans to attend college this fall to major in law enforcement and minor in forensic science. Cuba High School Student Council presents the senior of the month award each month. The student is chosen based on the following criteria: Self-management, responsibility, quality of work, high standards of attendance, superior academic principles, honesty, energy, optimism, teamwork, and positive use of rules or values. Presenting a $50.00 U.S. gift card to Renee Mance is Lisa Emberton from Mid America National Bank. The Cuba High School Student Council has chosen Scott Marlow as the November Senior of the Month. Scott is the son of Jodi and Jeff Marlow of Smithfield, Illinois. Scott’s current classes are Calculus, Weights, Art Portfolio, English IV, Speech and Communications at Spoon River College, Physics and, Spanish III. During high school, Scott has been involved in Student Council, Family, Career, and Community Leaders of America, Football, Track and Field, and Prom Committee. Scott plans to attend Millikin University in Decatur, Illinois and major in athletic training. Cuba High School Student Council presents the Senior of the Month award each month. The student is chosen based on the following criteria: Self-management, responsibility, quality of work, high standards of attendance, superior academic principles, honesty, energy, optimism, teamwork, and positive use of rules or values. Presenting a $50.00 U.S. gift card to Scott Marlow is Jayme Jorgensen from Mid America National Bank. The Cuba High School Student Council has nominated Paige Fahnestock as the October Senior of the Month. Paige is the daughter of Rick and Beth Fahnestock of Wee-Ma-Tuk, Illinois. Her current classes are Physics, English IV, Resource Management, Calculus, Weights and Conditioning, Office Procedures and Dual Credit American Government at Spoon River College. During high school, Paige has been involved in Volleyball, Basketball, Softball, Dance Force, Student Council, Peer Assistance, Yearbook, Spanish Club, Family, Career and Community Leaders of America and National Honor Society. Paige plans to attend a college/university and major in Pre-Dentistry or Biology. Upon completing her degree, she plans on going to Dental School to become a Dentist. Cuba High School Student Council presents the senior of the month award each month. The student is chosen based on the following criteria: self-management, responsibility, quality of work, high standards of attendance, superior academic principle, honesty, energy, optimism, teamwork, and positive use of rules or values. Presenting a $50.00 U.S. gift card to Paige Fahnestock is Lisa Emberton from Mid America National Bank. The Cuba High School Student Council has chosen Mackenzie Patch as the September Senior of the Month. Kenzie is the daughter of Mark and Terrah Cornell of Cuba, Illinois. Her current classes are Calculus, World Religions, Resource Management, English IV, Physical Education, Psychology and Office Procedures. During High School, Kenzie has been involved in Dance Force, Volleyball, Student Council, Peer Assistance, Yearbook, Spanish Club, and National Honor Society. Kenzie plans to attend Spoon River College this fall to get her associate's degree in psychology. After she earns her associate’s, she hopes to go to Bradley University to major in psychology. Cuba High School Student Council presents the Senior of the Month award each month. The student is chosen based on the following criteria: Self-management, responsibility, quality of work, high standards of attendance, superior academic principles, honesty, energy, optimism, teamwork, and positive use of rules or values. Presenting a $50.00 U.S. gift card to Mackenzie Patch is Kim Garber from Mid America National Bank. The Cuba High School Student Council has chosen Jake Beekman as the May Senior of the Month. He is the son Genie Mooney of Cuba, Illinois and Eric Beekman of Bushnell, Illinois. His current classes are American Studies, Weights, Art Portfolio, Student Help Desk, Art II, English IV, and Childcare. During high school, Jake has been involved in Football, Track and Field, Golf, National Honor Society, Art Club, Spanish Club, FCCLA, Student Council, and Drama Club. Jake plans to go to Army Basic Training this summer, and become a combat medic. From there, he plans on going to Northern Illinois University to become a Physicians Assistant. Cuba High School Student Council presents the Senior of the Month award each month. The student is chosen based on the following criteria: Self-management, responsibility, quality of work, high standards of attendance, superior academic principles, honesty, energy, optimism, teamwork, and positive use of rules or values. Presenting a $50.00 U.S. gift card to Jake Beekman is Lisa Emberton from Mid America National Bank. The Cuba High School Student Council has chosen Bryant Ouellette as the April Senior of the Month. Bryant is the son of Danette and Thayne Ouellette of Cuba, Illinois. His current classes are Accounting, P.E, Adult Living, Art, English IV, Sociology, and Current Events. During high school, Bryant has been involved in Basketball, and FCCLA. Bryant plans to attend Spoon River College this fall. After the two years of Spoon River College he plans on attending a four year school. Cuba High School Student Council presents the Senior of the Month award each month. The student is chosen based on the following criteria: Self-management, responsibility, quality of work, high standards of attendance, superior academic principles, honesty, energy, optimism, teamwork, and positive use of the rules or values. Presenting a $50.00 U.S. gift card to Bryant Ouellette is Lisa Emberton from Mid America National Bank. The Cuba Student Council has nominated Addy Stufflebeam as the March Senior of the Month. Addy is the daughter of Terry Stufflebeam of Cuba, Illinois and Corrina Freiheit of Havana, Illinois. Her current classes are English IV, Resource management, Adult Living, Calculus, Agriculture Technology, Sociology, and Spanish III. During high school, Addy has been involved in FFA, Yearbook, Cheerleading, Spanish Club, and National Honors Society. Addy is currently serving as the FFA Chapter President and Section Reporter. Addy plans to attend Western Illinois University in Macomb this fall and major in agriculture education. Cuba High School Student Council presents the senior of the month award each month. The student is chosen based on the following criteria: Self-management, responsibility, quality of work, high standards of attendance, superior academic principles, honesty, energy, optimism, teamwork, and positive use of rules or values. Presenting a $50.00 U.S. gift card to Addy Stufflebeam is Lisa Emberton from Mid America National Bank. The Cuba High School Student Council has chosen Paul Bailey as the February Senior of the Month. Paul is the son of Paul and Angel Bailey of Cuba, IL. His current classes are Accounting, Weights, Adult Living, Anatomy and Physiology, English IV, Help Desk, and Chemistry. During high school, Paul has been involved in Football, Track and Field, FCA, National Honor Society, Ironman Volleyball. Paul plans to attend Spoon River College and get his Associates Degree, then transfer to Western Illinois University and Major in Athletic Training. Upon completing his degree, he plans on getting a job for a sports team for being an athletic trainer. Cuba High School Student Council presents the Senior of the Month award each month. The student is chosen based on the following criteria: Self-management, responsibility, quality of work, high standards of attendance, superior academic principles, honesty, energy, optimism, teamwork, and positive use of rules or values. Presenting a $50.00 U.S. gift card to Paul Bailey is Janet Gray from Mid America National Bank. The Cuba High School Student Council has chosen Alexandrea Thomas as the January Senior of the Month. Alex is the daughter Angie Thomas and Jeff Bass of Cuba, Illinois. Her current classes are English IV, Weights, Living Environments, Ag Tech, Art III, Dual Credit Geography at Western Illinois University, and Dual Credit Nutrition at Spoon River College. During high school, Alex has been involved in Cheerleading, Yearbook, and FFA. Alex will be attending Western Illinois University this fall and major in agriculture science. Cuba High School Student Council presents the Senior of the Month award each month. The student is chosen based on the following criteria: Self-management, responsibility, quality of work, high standards of attendance, superior academic principles, honesty, energy, optimism, teamwork, and positive use of rules or values. Presenting a $50.00 U.S. gift card to Alex Thomas is Lisa Emberton from Mid America National Bank. The Cuba High School Student Council has chosen Michaela Reynolds as the December Senior of the Month. Michaela is the daughter of Rebecca and Michael Reynolds of Cuba, Illinois. Her current classes are English IV, Spanish II, Dual Credit General Education Math, Dual Credit Ag Tech, Dual Credit American History, Dual Credit Introduction to Literature, and Dual Credit Philosophy at Spoon River College. During high school, Michaela has been involved in Cheerleading, Yearbook, Spanish Club, and FFA. Michaela plans to graduate from Spoon River College and Cuba High School in the Spring of 2016. Next Fall, she plans on attending University of Illinois and majoring in kinesiology. Cuba High School Student Council presents the Senior of the Month award each month. The student is chosen based on the following criteria: Self-management, responsibility, quality of work, high standards of attendance, superior academic principles, honesty, energy, optimism, teamwork, and positive use of rules or values. Presenting a $50.00 U.S. gift card to Michaela Reynolds is Michelle Banta from Mid America National Bank. The Cuba High School Student Council has chosen David Almeida as the November Senior of the Month. David is the son of Becky and Charles Almeida of Cuba, Illinois. His current classes are Accounting, German II, Physical Education, Physics, English IV, Psychology, and French I. During high school, David has been involved in Scholastic Bowl, Chess Club, Peer Assistance, Student Council, Family Career and Community Leaders of America, Drama Club, Basketball, Golf, and Track and Field. David has enlisted in the U.S. Navy and will ship off to Recruit Training Command at Naval Station Great Lakes near North Chicago in July after graduating high school. He is pursuing a career in Nuclear Power for the U.S. Navy. He also has an application into the Naval Reserve Officers Training Corps. Cuba High School Student Council presents the senior of the month award each month. The student is chosen based on the following criteria: Self-management, responsibility, quality of work, high standards of attendance, superior academic principles, honesty, energy, optimism, teamwork, and positive use of rules or values. Presenting a $50.00 U.S. gift card to David Almeida is Lisa Emberton from Mid America National Bank. The Cuba High School Student Council has chosen Logan Corsaw as the October Senior of the Month. Logan is the son of Chuck and Joy Corsaw of Cuba, IL. His current classes are Pre - Calculus, Weights, Living Environments, Dual Credit Conservation, English IV, Psychology, and Office Help. During high school, Logan has been involved in Baseball, Basketball, Student Council, and FFA. Logan plans to go to college and major in Business Management or Engineering and play baseball. Cuba High School Student Council presents the Senior of the Month award each month. The student is chosen based on the following criteria: Self-management, responsibility, quality of work, high standards of attendance, superior academic principles, honesty, energy, optimism, teamwork, and positive use of rules or values. Presenting a $50.00 U.S. gift card to Logan Corsaw is Kara Leighton from Mid America National Bank. The Cuba High School Student Council has chosen Madison Miller as the September Senior of the Month. She is the daughter of Stan and Lori Miller of Smithfield, Illinois. Her current classes are Accounting, Weights, English IV, Calculus, Spanish IV, Dual Credit Psychology, and Dual Credit College Algebra at Spoon River College. During high school, Madison has been involved in Volleyball, Basketball, Softball, Student Council, Peer Assistance, Yearbook, Spanish Club, FCCLA, and National Honor Society.Madison plans to attend Southern Illinois University in Edwardsville or University of Iowa next fall and major in Pharmacy or Orthodontics.Cuba High School Student Council presents the Senior of the Month award each month. The student is chosen based on the following criteria: Self-management, responsibility, quality of work, high standards of attendance, superior academic principles, honesty, energy, optimism, teamwork, and positive use of rules or values. Presenting a $50.00 U.S. gift card to Madison Miller is Michelle Banta from Mid America National Bank. The Cuba High School Student Count has nominated Jordan Maxwell as the May senior of the Month. Jordan is the daughter of Mike Maxwell and Brandy Maxwell of Cuba, Illinois. Her current classes are English IV, Physical Education, Earth Science, Foods II, Weights and Conditioning, Living Environments, Calculus, and Spanish IV. During High School Jordan has been involved in Volleyball, Basketball, Softball, Dance Force, Peer Assistance, SWAT Teen Staff, Yearbook, Spanish Club, and National Honor Jordan plans to attend Eureka College this fall and major in Business. She will also play basketball for the Women’s Basketball team. Cuba High School Student Council presents the Senior of the Month award each month. The student is chosen based on the following criteria: Self­management, responsibility, quality of work, high standards of attendance, superior academic principles, honesty, energy, optimism, teamwork, and positive use of rules or values. Presenting a $50.00 U.S. gift card to Jordan Maxwell is Lori Shaeffer from MidAmerica National Bank. The Cuba High School Student Council has nominated Joseph Petersen as the April Senior of the Month. Joseph Petersen is the son of Heidi Petersen of Canton, IL and Patrick Petersen of Plymouth, IL. His current classes are English IV, Pre­Calculus, Resource Management, Student Help Desk, Intro to Sociology, Weights, Ag Business, and Art I. During High School Joseph has been involved in FFA, Scholastic Bowl, and Family, Career, and Community Leaders of America. Joseph plans to attend Spoon River College in Canton this fall and get an associate degree in arts and science. Upon completing his degree, he plans on transferring to a four year university and major in political science. Cuba High School Student Council presents the Senior of the Month award each month. The student is chosen based on the following criteria: Self­management, responsibility, quality of work, high standards of attendance, superior academic principles, honesty, energy, optimism, teamwork, and positive use of rules or values. Presenting a $50.00 U.S. gift card to Joseph Petersen is Samantha Wilson from Mid­America National Bank. The Cuba High School Student Council has nominated Blake Myers as the March Senior of the Month. Blake is the son of Angie and Tim Myers of Cuba, Illinois. His current classes are Physical Education, Art II, English IV, Algebra II, Ag Business, Art I, Study Hall, and Horticulture. During high school, Blake has been involved in Baseball, Basketball, Football, FFA, Art club, Chorus, and National Honor Society. Blake plans to attend Spoon River College. He plans on taking General Studies. Cuba High School Student Council presents the Senior of the Month award each month. The student is chosen based on the following criteria: Self­ management, responsibility, quality of work, high standards of attendance, superior academic principles, honesty, energy, optimism, teamwork, and positive use of rules or values. Presenting a $50.00 U.S. gift card to Blake Myers is Kara Leighton from MidAmerica National Bank. The Cuba High School Student Council has nominated Kaylee Doubet as the February Senior of the month. Kaylee is the daughter of Scott and Lisa Doubet of Cuba, Illinois. Her current classes are Physical Education, Resource Management, English IV, Foods II, Child Care, Dual Credit Plane Trigonometry at Spoon River College, Accounting, and Art IV. During high school, Kaylee has been involved in Spanish Club, Art Club, FCCLA, Yearbook, National Honor Society, Student Council, Peer Assistance, and Softball. Kaylee plans to attend Western Illinois University in Macomb this fall to major in pre-pharmacy. Upon completing her degree, she plans to attend graduate school to become a pharmacist. Cuba High School Student Council presents the Senior of the Month award each month. The student is chosen based on the following criteria: Self-management, responsibility, quality of work, high standards of attendance, superior academic principles, honesty, energy, optimism, teamwork, and positive use of rules or values. 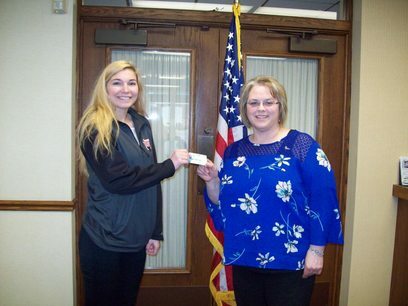 Presenting a $50.00 U.S. gift card to Kaylee Doubet is Kara Leighton from Mid-America National Bank.